A Scottish farmer has been using a 'pants' idea to test the fertility of his soil by burying cotton underwear. 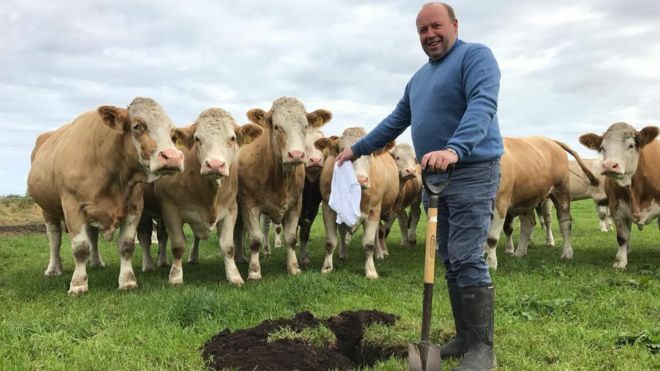 Beef cattle breeder Iain Green who farms at Corskie Farm, just north of Elgin, buried six pairs of his white underpants around his 2800-acre spread for the unusual experiment in soil testing. The theory was that the more the material disintegrated, the healthier and more robust the soil. The trials were conducted in collaboration with Quality Meat Scotland (QMS) and the Agriculture and Horticulture Development Board (AHDB). Mr Green said: “I’m really interested to see the state all the underpants are in. The theory behind the Soil my Undies test is that the cotton will be devoured by the microbes and bacteria in the soil, so the more you have the better. Tim Isaac, AHDB Cereals & Oilseeds Head of Knowledge Exchange, said: “Burying underwear sounds like a bit of fun, but it can also give us some serious messages about future-proofing our soils. The exercise is part of AHDB’s Monitor Farm programme #soilmyundies initiative, where farmers have been burying their pants to help them find out about their soil health. • Bury a pair of white 100% cotton briefs or boxers in the top six inches of soil. • Leave the waistband showing and mark the location. • To test the impact of soil type, rotation and management, repeat at several locations. • After eight weeks, extract the underwear carefully and wash them in a bucket of water.